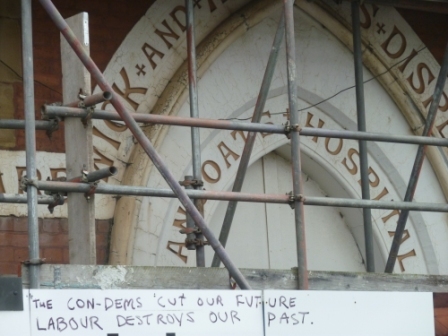 A fight to save the derelict Ancoats Dispensary is bringing together a fractured community. Marston’s home was demolished as part of New Labour’s regeneration of inner cities, where streets of decrepit council housing were cleared by government agencies to make way for upmarket private developments. New Islington in Ancoats was built in place of the impoverished Cardroom Estate as a showcase “millennium community” for this new “city living” lifestyle under the stewardship of developers Urban Splash. The intended 1,400 new homes, less than one tenth of which would have been social housing, never materialised. 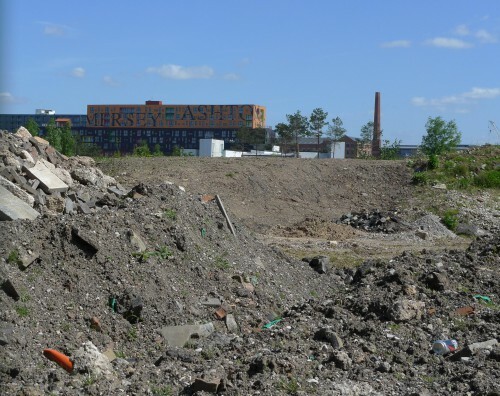 Urban Splash received significant public assistance in developing the site when work began 11 years ago, including land provided by Manchester City Council and £22m from the Homes and Communities Agency. But the property market crashed and only 179 homes were built, around 50 of which are social houses for resettled Cardroom Estate residents. House prices in Greater Manchester have declined for two years, creating an uninviting environment for profit-seeking investors, and the limited access to cheap finance means the originally planned luxury apartments are off in favour of low rise housing when, or if, the market recovers. Today New Islington is an eerie mix of colourful yet isolated apartments, fenced off wasteland, and a canalside marina festooned with Private Property signs. Ancoats Hospital, a Grade II listed Gothic Revival dispensary precariously supported by scaffolding and lacking its roof and tower, stands in the middle of New Islington. News that Urban Splash had been granted listed building consent to demolish it last summer shocked locals. 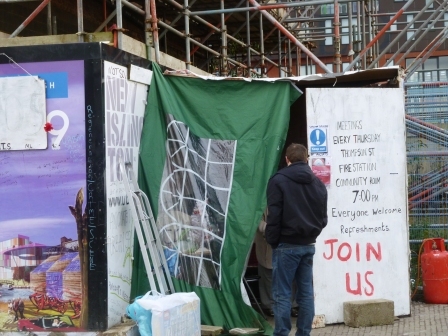 A campaign, Save Ancoats Dispensary, was quickly formed and, in a demonstration of the enormous strength of feeling in the area, concerned locals have since held a continuous vigil of the threatened building. “This thing, 1889 is when it was built as a penny dispensary for all the people who were working in the mills around here. It’s got so much history involved I can’t believe it,” said campaigner Liam Ryan. For Ryan, the dispensary was more than just a building. “It’s so much an iconic part of Ancoats. If this goes it’s the last remaining trace,” he explained. Lomas said Ancoats was becoming a “ghost town” for many residents as pubs and social clubs had vanished over the decades. Now, he argued, in contrast to previous times when locals had pooled their funds to build a Labour Club as the hub of their community, the area had been sidelined and taken for granted by local politicians who could rely on safe majorities. “This is a big Labour Party area, this. You vote them into power and they don’t help you”, he said. Urban Splash initially intended to renovate the dispensary into apartments. In 2001 the company’s chair and co-founder Tom Bloxham notoriously promised, “If we don’t deliver on this one, we’ll never work in this city again.” Little was done however and after the crash the company took the decision to “mothball” the building, beginning negotiations with the North West Development Agency (NWDA) for £1m to shore it up by repairing the roof and interior walls. The NWDA gave the company an initial £100,000 pending final release of the remaining £900,000, and Urban Splash started work erecting scaffolding and removing the roof. But in 2010 the incoming coalition government scrapped the NWDA, pulling the remaining funding and leaving the dispensary a shell. Urban Splash has not fared well since the crash and says it has no choice but to make the “reluctant” decision to tear the building down. 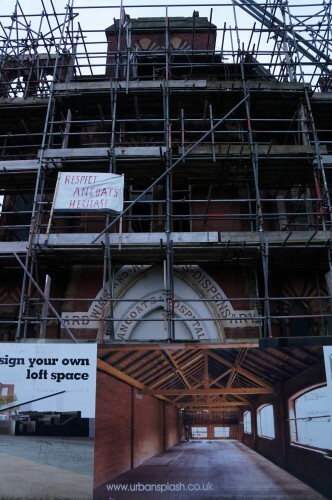 The campaign to Save Ancoats Dispensary refuses to take the matter as settled, and are urgently fundraising for a structural engineer to conduct an independent survey. The group wants more than to preserve the building for its own sake and are putting together a business plan in a bid to return it to common use. “It could become the centre of Ancoats. 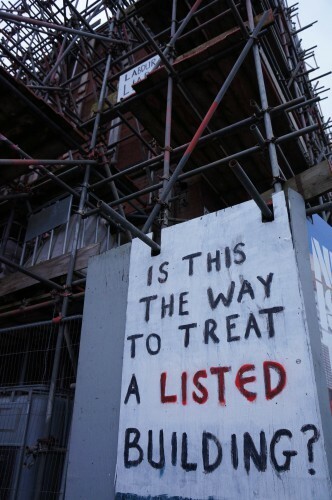 Ancoats is almost being squeezed out,” said campaign chair Linda Carver. Ancoats has not fared well in recent decades, as first jobs and then homes were destroyed and the pubs and social clubs which formed the backbone of the area’s society faded away. But the campaign to save the dispensary is bringing people together with their own view for the area, one not willing to accept the orders of local politicians and property men. In its own way, the dispensary is becoming a place of healing once again.